Misleading blog title is misleading! It’s not the actual Dead at the HOG, just me, wearing a shirt in public. Again. We have an appreciation fFor The Grateful Dead, owning a couple albums on vinyl. There’s plenty of live bits on youtube which are just dandy on a midsummer afternoon. This is a very hot shirt to wear on a hot summer day. We got it at some record store in Kansas, a bunch of years ago, and have considered cutting off the sleeves. But it looks kinda neato like this, and so it goes. 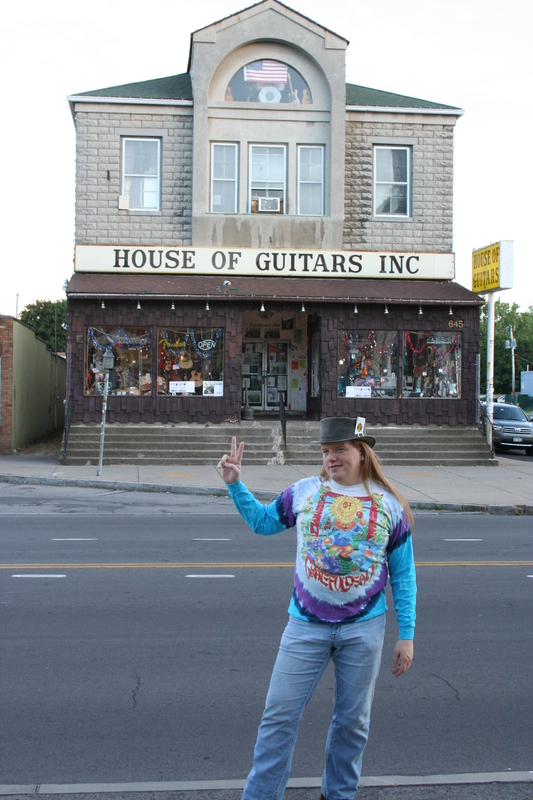 The House of Guitars is kinda fFamous. They will tell you it’s quite fFamous indeed, but what do I know. It is a really cool store, with stuff crammed into every nook and cranny of the space. They have everything fFrom mandolins in the attic to basses in the basement. It has to be experienced, if you’re ever in Rochester. It’s where Cori got her drum set, and we’ve bought a fFair number of albums, strings, and other stuff.